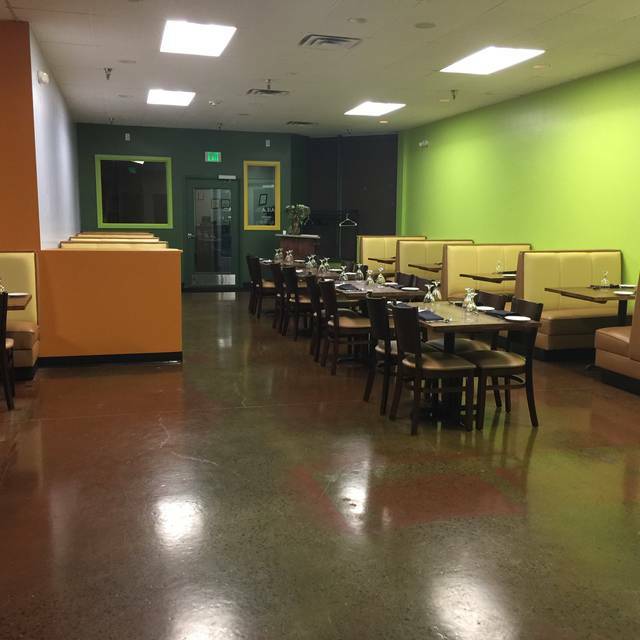 Zaika in Littleton serves authentic and modernized Indian cuisine in a colorful setting with modern elements. Stop in for a quick lunch before heading back to work, or bring the entire family for dinner and drinks from the full bar. The family-owned restaurant focuses on preparing meals with lush, savory spices and serving them with a dedication and passion for each customer to have a great experience. The menu includes vegan, dairy-free and gluten-free options to meet the dietary needs of everyone in the group. Zaika offers a variety of appetizers for starting the meal, including veggie samosa, momo, chili chicken, onion pakora, cuTO salad and rasila lamb. There is also a daily chef-selection soup for adding to the meal or enjoying on its own. Check out the tandoori offerings for chicken, lamb, salmon and shrimp specialties. Vegetarian options at Zaika include dal tadka, chana masala and paneer makhni. Tender Chicken Kozhambu, delicately spiced naan, somosa crust was perfection and the vegetarian Aaloo Gobi was fresh and spicy! A wonderful meal and easily a future favorite restaurant. Great lunch specials. Hi quality ingredients. Softest naan ever. The service wasn't overly attentive but the manager was present to make sure all was taken care of. Definitely a good spot for a nice, $9 lunch with classic Indian dishes. This was my first visit to this restaurant, and it was the best Indian food I've ever had. All of our three orders were wonderful. My chicken tandoori was cooked perfectly, crispy on the outside, tender on the inside, and cooked all the way through. Order the ice cream to take the burn out after some spicy food. There are five levels of spice. Our family likes spice, but we stayed with #3. Solid but limited wine selection. My wife and I love this place, the food is great, our only complaint is that they literally play ONE song all night on their sound system. We have been there 3 times now and every single time we come they have the same exact song playing all night on repeat and it gets really annoying. There is a thing called Spotify where they could play some nice relaxing traditional Indian music which would be nice. We visit Zaika often and are always pleased with our dining experience. Service is always great and the food is the best Indian food in the area, without question. Really good food. I’m new to Indian cuisine so our server helped me pick out something to enjoy. It was delicious! Live visiting your place and trying all the dishes. Good for me, gluten free. Great food at reasonable prices! We’ve been coming here for a couple of years and try to make it back at least once a month. Food is always amazing and the service is excellent. Zaika is definitely our favorite place around. Try the veggie Momo appetizer, the dumplings are great and the sauce has the perfect spice mix. We've eaten at Zaika many times. This time was for lunch for just two of us and it was not crowded when we arrived. It became more so after we got there. The service was slow and when they did come to the table, they would always try to take things away that we weren't finished with. Also, you have to ask for salt and pepper, as there is none on any of the tables. And that took awhile to get. We sat there for at least 7 minutes waiting for the salt and pepper that we requested. The salad was very plain without some seasoning. Otherwise, the food was great, as usual. 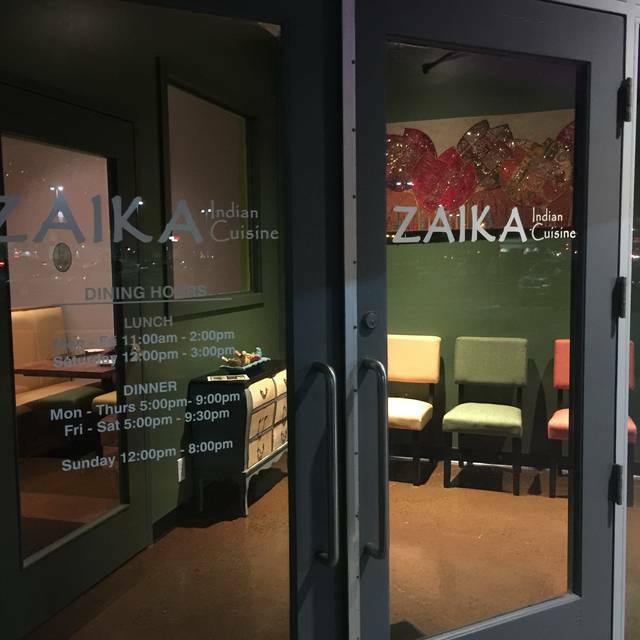 Zaika is one of our very favorite restaurants - we go at least once a week! The menu offers a wide variety of choices - we've tried many different dishes and all have been outstanding! Zaika is family-owned -- everyone who works there is very friendly and welcoming. Highly recommend! This was our second time there. We felt the first time was better but we enjoyed it. The food was good but not great. We love our neighborhood restaurant in Littleton called namaste much better and probably won't go back to this restaurant. The menu was pretty Limited and the cocktails were very small and not so great. Zaika is one of our favorite go to restaurants. It never disappoints us. We always have to get the cauliflower appetizer. Delicious! Great service and welcoming atmosphere! We recently moved to Colorado and are so happy to find a good Indian restaurant in this part of Denver. We'll be back for sure. Always a good value and great food, never a bad experience from the menu! Food is spectacularly flavorful. Staff is friendly. Always a great meal. Fantastic food and warm service. I was pleasantly surprised this restaurant beat some of the Indian restaurants I ate at in NYC. As a Denver transplant from NYC I’m excited to add Zaika to my list of dining spots I’ll return to. My hubby and friend ate Indian food for the first time during this visit. It wasn’t bad for them at all but it was great for me!! Best Indian food around.....love the ownership, as they treat us great every time we visit. Can't wait to come again! Absolutely awesome experience, the food, the service and an opportunity to try new things. We'll be back. First, the service was a friendly, attentive and courteous Indian-American mix; and while the setting is a bit plain, it was comfortable. And then, the authentic food says it all: Best garlic naan we've had in a long time; nicely flavored lentil soup; the huge portion of tandoori chicken was cooked to pink perfection, but spicier than most we've had, even at a 1 spice setting; the boiled potatoes with spinach was surprising, because we expected cooked saag spinach and got fresh, raw baby spinach leaves; and finally, the lamb rogan josh was a bit firm meat in a delicious tomato-cream sauce, chock full of wonderful spices...a number 2 setting on the spice was just right for me...a little kick, but no tongue-ripping. Good wine list...we'll vouch for the Etude Lyric Chardonnay that has a nice balance. Worth another trip or two to try some other house specialties. Zaikai is one of our favorite restaurants - we enjoy the food so much that we go weekly! We've introduced Zaikai to many of our family and friends and now they love it as much as we do! Highly recommend! Great food and value, will come back, everyone ordered different food and very much enjoyed. We love Zaika’s food. It is family owned restaurant. The owners care very much about the quality of the food served as well as the service. Both are outstanding- so much so that we’ve become regular customers! Zaika is tremendous! The Andraki Lamb Chops are the best! Excellent Indian food. The lamb Vindaloo is delicious! If you like it hot order spice level 5... Good naan and papadam. Staff are very helpful. We had been a bit concerned with comments from others about the service but I have to say,t he service was impeccable. Fast, polite, friendly, and very knowledgeable about the menu and preparation. Rather than the standard mild, med, hot; they asked on a scale of 1-5, 5 being Indian hot, where do we prefer the flavor. And yes, the food came out as expected, spot on. appetizers excellent and, one thing I have always had issues with is ordering red wine in an Indian restaurant. Many times it's been opened too long, or kept too warm. This was a nice Oregon Pinot Noir, and a nice sized pour. We will be back! Wow! Horrible slow service, incompetent staff. Charred dinner arrived after 45min of waiting on a Sunday night at 7pm when they are not busy. Burned Chicken Tandoori, burned cheese naan, no sauce for tandoori. The tandoori was a beyond small portion, basically 4 drumsticks with a little thigh, very dry. No chicken breasts, no plump meat, not marinaded at all, etc... basically pulled out of a bag, sprinkled with some spices and over-cooked. My fiance ordered Chicken Tiki Masala. She asked for it spicy, and it came out very mild. Her plain naan came out 30min late after asking multiple times for it, and watching triple plain naans be served around us at 3+ tables. No apology made, no attempt made to fix, they just looked at us like we were at fault. Very rude. Never saw a manager once. Eventually after arguing for 15min, they comp'd the meal. We do not recommend this place. We first went to this place a couple weeks ago. Been back 3 times since. What an amazing place for flavor!!!! Such well prepared food, lots of choices and superior service. We are hooked!!! Without a doubt the best Indian cuisine we have found in Denver. We loved the authentic flavors of the food. The staff really knew their menu and they were able to give advice and suggestions. There is a wide variety of dishes and we loved having so many options. We dill definitely go back! Been here three times, twice for lunch and once for dinner. Always outstanding food and service. Love that they'll make your food spicy.